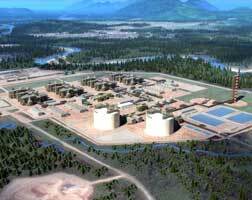 LNG Canada’s mega US$31 billion liquefied natural gas export (LNG) terminal in Canada has been given the go ahead by the partners involved: Anglo-Dutch firm Shell, Malaysia’s oil/gas firm Petronas, PetroChina Co Ltd, Korea Gas Corp (KOGAS) and Japan’s Mitsubishi Corp. Construction will start immediately on the facility in Kitimat, British Columbia, with first shipments of the super-chilled fuel expected before 2025, to meet surging demand from Asian buyers, primarily China. The construction decision comes amid a US-China trade dispute that has led to tariffs being imposed by China on LNG shipments from the US, threatening US President Donald Trump’s energy dominance plan. China is the fastest-growing major buyer of LNG and in 2017 overtook South Korea to become the world’s No. 2 importer, behind Japan. LNG Canada says it is advantaged by access to abundant, low-cost natural gas from British Columbia’s vast reserves and the relatively short shipping distance to North Asia, which is about 50% shorter than from the US Gulf of Mexico and avoids the Panama Canal. The LNG plant will be constructed on a large, partially-developed industrial site with existing deep-water port, roads, rail and power supplies. Global LNG demand is expected to double by 2035, with much of that growth coming from Asia where gas is displacing coal, it said. Each joint venture participant will be responsible to provide its own natural gas supply and will individually offtake and market its share of LNG. The FID is for two processing units or trains, with first LNG expected before the middle of the next decade. The initial output will be 14 million tonnes/year from the two trains, with the option to add two more trains to expand to 28 million tonnes/year. LNG Canada’s export plant has been designed to achieve the lowest carbon intensity of any large-scale LNG plant operating in the world today. It says it achieved this through a combination of using renewable hydropower from BC Hydro and highly-efficient gas turbine engines. With demand for LNG expected to double by 2035 compared with today as a result of global commitments to reduce greenhouse gas emissions and improve air quality, LNG Canada says it will provide natural gas to countries where imported gas could displace more carbon intensive energy sources and help to address global climate change and air pollution. The announcement provides a much-needed boost for Canadian Premier Trudeau’s ruling Liberals, who have struggled with an exodus of global energy firms from Alberta’s oil sands as well as setbacks in building a crude pipeline expansion to Canada’s Pacific Coast. Within that broader number, the cost of building the terminal has been pegged at US$14 billion, with the Coastal GasLink pipeline running C$6.2 billion. Canada has committed C$275 million to infrastructure and environmental performance measures related to LNG Canada, which will have the lowest carbon intensity of any large LNG facility in the world, Canada’s Premier Trudeau said.